I love me some spinach dip. Especially from restaurants. My favorite, by far, is the spinach dip from Cheddar’s. Have you had that dip? Oh my goodness, it is so good. But it’s one of those things that you really don’t want to know the calorie count on. Because it would just make you sad that you ate half of the container they sat before you. But here’s a version of a spinach dip that you don’t have to feel bad about eating. According to The Yummy Life, for a quarter of a cup, you are only eating 72 calories, or 2 Weight Watchers points. That’s not to shabby, I say. Even if you eat a half a cup (which is a more honest serving size for me), that’s only about 150 calories. I can do that. Now my husband and I don’t really like artichokes, like at all, so I was a little skeptical of this recipe. But let me tell you, I do not mind them at all in this. It doesn’t taste overly artichokey. Just delicious. I was also skeptical about the no added salt, but truly, this didn’t need it. So yummy just the way it is. So now that I’ve got your mouth watering and your stomach gurgling, let me give you the recipe. SLOW COOKER METHOD: Coat the slow cooker with cooking spray. Add all ingredients except the red bell pepper. Stir to combine, cover and cook until heated through. 1-1/2 to 2 hours on high, 3 to 4 hours on low. Recipe may be doubled. OVEN METHOD: Preheat oven to 350 degrees. Set aside half of mozzarella and Parmesan cheeses. In a large bowl, stir together all remaining ingredients but the red bell pepper. Spoon mixture into greased or sprayed 1-1/2 to 2 quart baking dish. Sprinkle top with remaining cheeses. Bake uncovered for 25-30 minutes or until bubbly and golden. TO SERVE: Sprinkle cooked dip with diced red pepper, if desired. 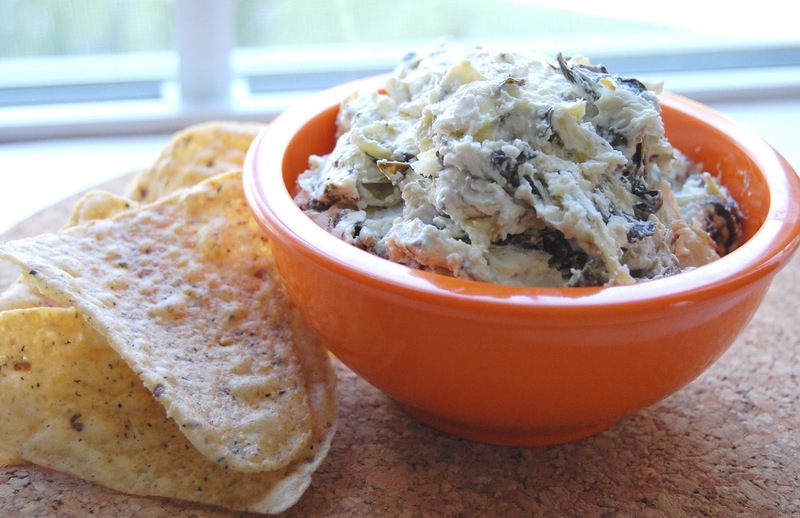 Serve warm with crackers, tortilla chips, pita chips, crostini, or raw veggies. 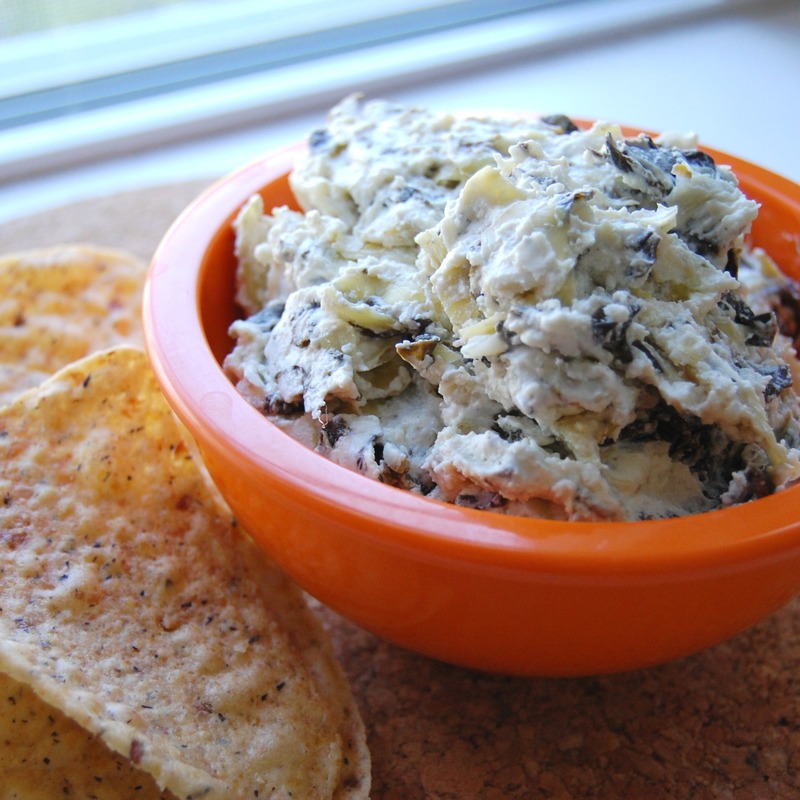 Do you have the Spinach Dip Love? Linked up on Mix it Up Monday and Tasteful Tuesdays.